Andy Rainforth, Managing Director asks- As Xi Jinping begins his second term as China’s Communist Party General Secretary would anyone bet against him serving a third? In a move that marks him out as the most powerful Chinese leader since Chairman Mao, “Xi Jinping Thought” has now been enshrined within the Chinese Communist Party’s constitution. This means that any future rival wouldn’t just confront Xi, but would challenge the very constitution. Does this pave the way for President Xi to carry on beyond 2022, when his second term as party head expires? Many commentators think so. 1949 – 1976 Mao Zedong founds the People’s Republic of China. He begins a process of ‘opening’ China to the west and in 1975 ‘Mao Zedong Thought’ is introduced into the Constitution. Deng Xiaoping dominated the 1980’s and began to openly embrace market economics and the accumulation of wealth. 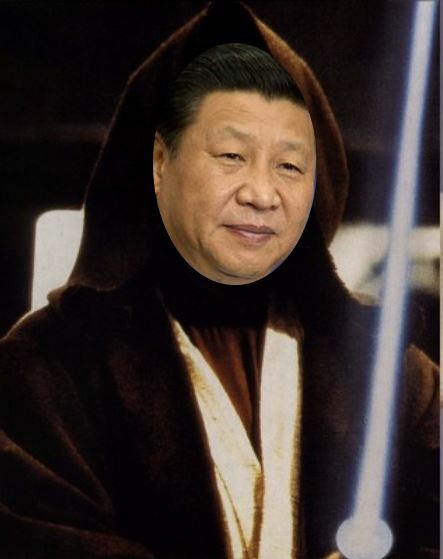 Xi Jinping assumes power in 2012, leading with policies of sustainability, efficiency and anti-corruption. China’s economy is predicted to overtake the US as the largest globally at some stage in the next couple of decades but as the population rates and economic expectations multiply, the ‘China Export’ ambition should be viewed as one borne of necessity, as much as an end in itself. Xi’s ‘One belt, One road’ policy sees China expanding to the West across land and rail (economic expansion has been largely sea faring to date) utilising the traditional silk trade routes. In tandem, greater emphasis has been given to fulfilling China’s domestic consumption needs with domestic products, thus fuelling/protecting GDP rates and in part explaining China’s ability to avoid the much forecast ‘hard-landing’ in mid-2016. As a consequence, overseas importers looking to China as a burgeoning market have recently seen their previous Foreign Direct Investment policies thwarted as a result of favouritism for local brands. Xi walks the line of positioning China as ‘open for business’ to Western firms looking for low cost manufacture, yet is pouring investment into Africa to establish its own lower-cost manufacture region for (often state owned) Chinese domestic brands. In the next decade or so Africa is destined to become China’s China. Just when Western brands think they have established dominance through arbitrage, they may discover that Chinese competitors are able to once again take a cost leadership position. I’ve written several times that my own view is that a one party political system – not influenced or distracted by 4/5 year political cycles is ideally placed to take best advantage of a global market economy and this suppression of imports and subsidies for local brands, is just one example. The FT makes the point that Chinese banks have performed less well than western counterparts in terms of global investment bank spending. Well, that’s one way of looking at it – but here’s another. Chinese onshore bond markets have plummeted between 2016 and 2017, as Beijing introduced ‘regulation’ [read that as ‘instruction’] for less new debt issuance in order to discourage a dangerous debt build up following years of break-neck expansion. It’s the very size of China’s debt market and the fact that Xi can seemingly turn on and off debt demand (and supply) like a tap, that has led to the Chinese investment banks’ position. In real terms onshore debt is down over $1bn year on year, but in fact the share of this debt taken up by Chinese investment banks has actually increased to over 95%, further evidence of overseas suppliers struggling to take any advantage of a still $2bn ‘open’ market. 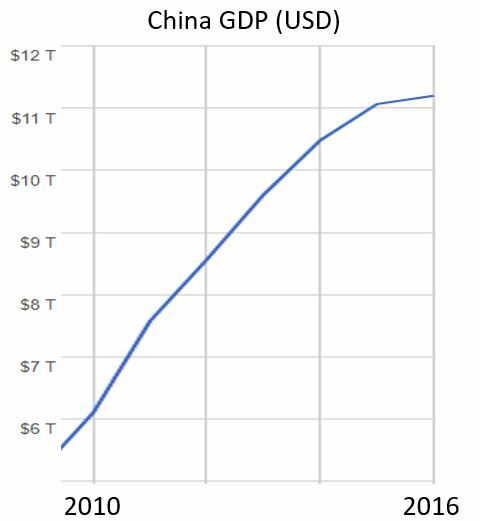 What is often missed when commentators talk about China’s GDP growth rate falling over recent years is that this doesn’t accurately reflect the growth in absolute terms. To put this into perspective I’ve included 2 charts. The declining one demonstrates the falling percentage growth rate, but the second shows the impressive GDP growth over the same period. Naturally as GDP rises, maintaining rising growth rates becomes unsustainable. 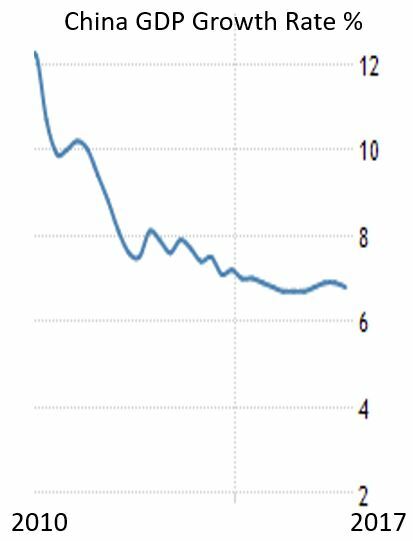 I suspect that President Xi, as he plans the next 50 years of economic positioning with his Politburo brethren, would be quite happy to maintain 6.8% GDP growth rates for as long as this is viable. For the rest of the world, there’s no reason to suspect any change as China continues to build its global economic empire. But given how much of this expansion is debt fuelled, the sheer scale of its growth, challenges with housing and wage inflation in China and the extent to which the publicly traded companies are influenced by state – one would be forgiven for questioning whether we are looking at the biggest bubble the world has yet to see. If Luke Skywalker were a macro-economist, he may “have a very bad feeling about this”.